Yeah yeah, been there, done that right? Well in the case of Mary Street bakery, somewhere with a constantly updated menu and a stream of delicious pastries, a revisit is always necessary! 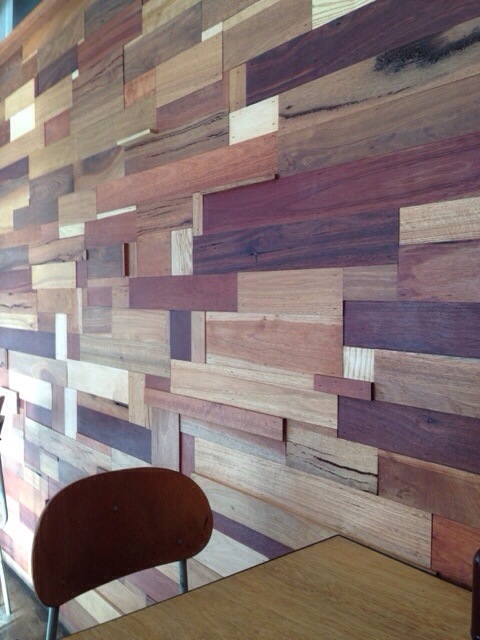 Once again we were impressed by the vintage, predominately wooden decor and relaxed atmosphere of the venue. We were given menus and had our coffee orders taken promptly, though as we arrived on opening time it took a while to get our drinks. 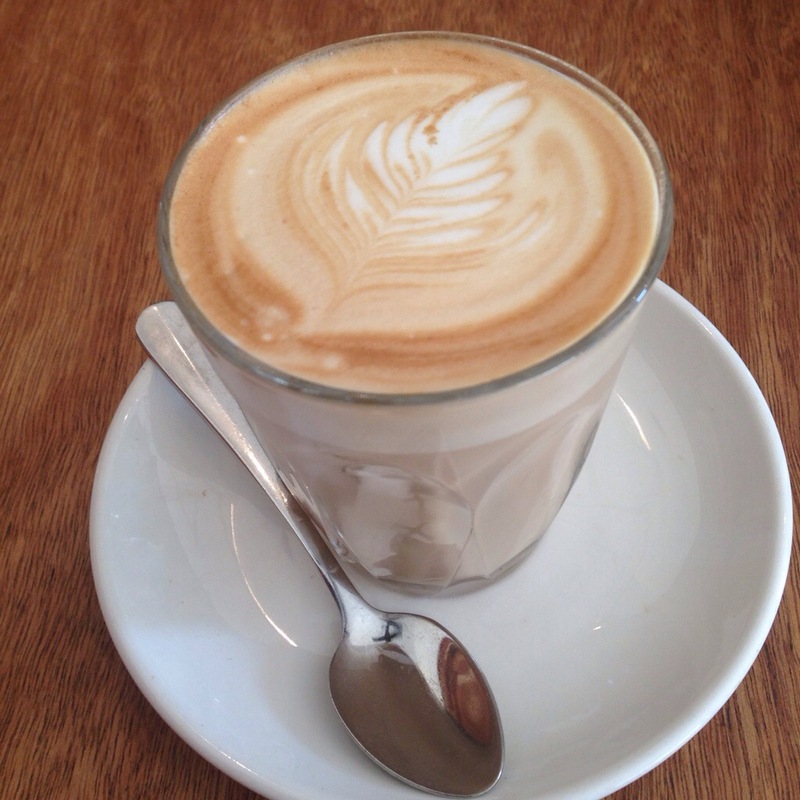 The coffee was fantastic, creamy and the perfect temperature from when it arrived at our table. The flavour was beautiful, strong without being bitter. Our second coffees were just as impressive, a real testament to the consistency of the baristas here. We ordered both a savoury and a sweeter dish to sample, the granola and the pig in a blanket. 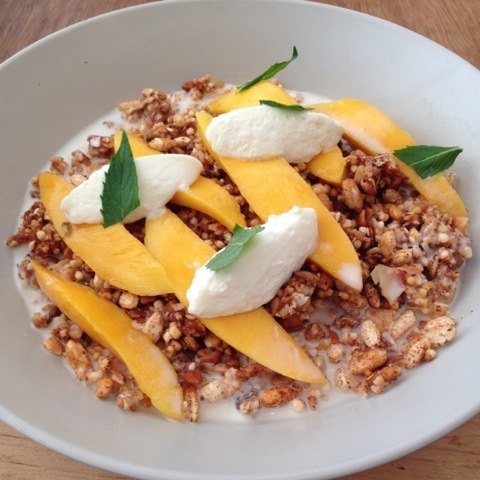 Our sweet dish this time was a gluten free granola, with coconut milk and mango. Now this is our kind of granola, extra crunchy, with lots of interesting textures throughout. 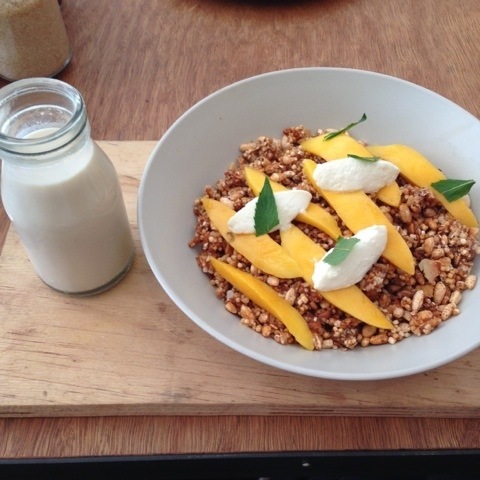 The coconut milk added an extra flavour dimension to the dish which was fantastic with mango. The dish as a whole became a bit overpowering towards the end, and we didn’t finish it. That being said we would still order it again. I don’t know what it is about food and childhood nostalgia lately but once again we got a dish that brought me back to my childhood. 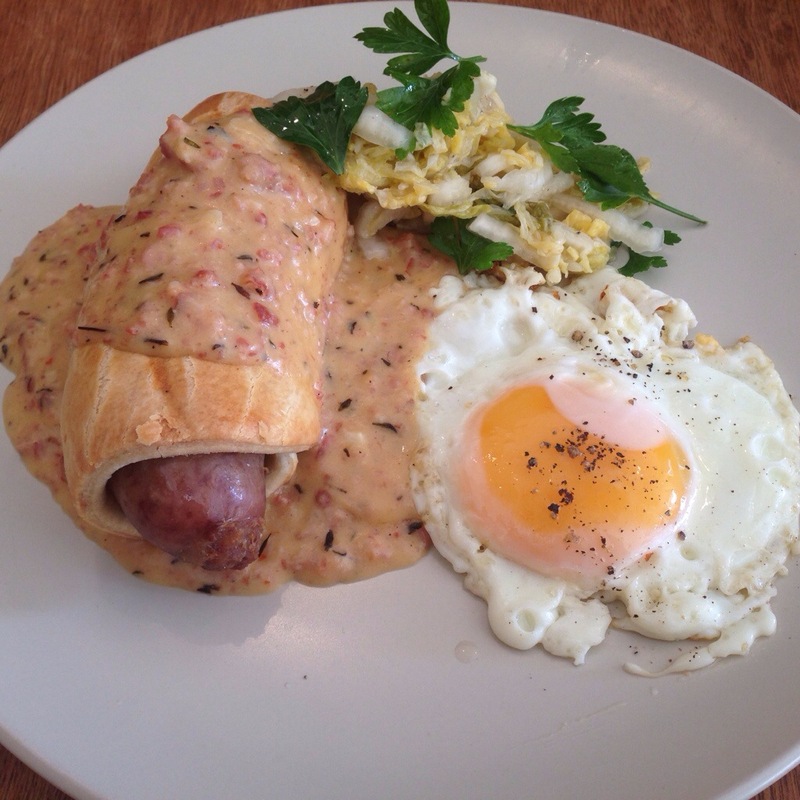 A Pig in a blanket , complete with bacon gravy, fried egg and sauerkraut. By far the best part of the dish was the bacon gravy, meaty, creamy and absolutely full of flavour. The egg was cooked well with a gooey yolk, ready to mopped up with the sausage. The sausage itself was good, nothing outstanding and the pastry was a touch thick, this was a meal that worked best when all the elements were combined together. However at over $20 it was quite a pricey meal, especially considering it was a single egg and single sausage. Overall Mary Street Bakery continues to impress with unique and interesting dishes and flavour combinations, as well as consistently fantastic coffee and it will be somewhere that we will probably keep coming back to.